Heading into the NBA’s eventful offseason, it seemed inevitable that the New York Knicks would be moving Carmelo Anthony in a major trade. Instead, Phil Jackson left the organization, the ‘Bockers seemed to temporarily stabilize the ship and Carmelo’s still a Knick, for now. It’s still very likely the star forward is dealt before preseason, but there are a lot of hurdles to that occurring. Plenty has happened since Anthony first appeared on the trade block, so let’s check in on the top reasons why he remains in New York. This is the biggest hurdle of all, because it severely limits where ‘Melo can go. He’s indicated he’d like to play with the Cleveland Cavaliers or the Houston Rockets, teams that are title contenders and feature close friends of his on the roster. While with the Knicks, Jackson was never all that supportive of Anthony or his isolation-focused offensive style. Yet Jackson also handed him this no-trade clause which currently handcuffs everyone involved. If it weren’t for the no-trade, Carmelo likely would’ve been traded at least year’s deadline to a fringe playoff team with some cap space. Even now, there are plenty of teams with room and a need for a scorer of Anthony’s caliber on their respective rosters. Those teams have the types of assets the Knicks want, but they can’t make a deal since he won’t approve a trade to those cities. When news broke about Kyrie Irving requesting a trade from the Cavaliers, all eyes went directly to New York — one of the four teams which the young point guard listed as a possible destination. Anthony is good friends with LeBron James, some sort of swap of Carmelo and Kyrie seems like the best move for both parties. But Kyrie still has two years remaining on his deal, and is only 25 years old. He also doesn’t have a no-trade clause. So not only are the Cavaliers not obligated to trade him at all, but they’re certainly not obligated to trade him to a team of his choosing (the Knicks, Spurs, Heat or Timberwolves). That said, the rift between Irving and James likely motivates a trade despite that contract. But that motivation doesn’t mean he’s being let go at a discount. Irving’s an All-Star, NBA champion and dynamic scorer still in his mid-20s. Nothing short of LeBron telling the Cavs exactly what to do is going to force Irving out for less than he’s worth. The Rockets just added a large salary in Chris Paul’s $24.6 million for the 2017-18 season. Anthony makes $26.2 million this coming year (before his trade kicker). James Harden will make $28.3 million. Just those three players alone would equal $78.8 million — $20 million or so shy of the NBA’s soft salary cap ceiling of $99.1 million. Four more Houston players make at least $7 million on the current roster. One of those, Ryan Anderson, makes over $19 million. Anderson would have to be dealt in any trade, but he also has two more years on his current contract, both north of $20 million. The Rockets could sweeten a deal with expiring contracts and picks, but Anderson’s contract still handcuffs whoever receives it for several more years. Houston’s flexibility was dealt to the Clippers in the Paul deal, and that makes Carmelo a longshot without other teams getting involved. Cleveland’s a bit easier of a swap situation, since they’d be dealing a desirable large salary (Irving’s) to New York for Anthony’s. However, this can’t be a straight one-for-one deal if Cleveland’s going to get back something commensurate with Kyrie’s youth/talent level. That means contracts leaving New York, which quickly gets problematic for the Cavs, who are already in the luxury tax. The Cavs are nearly $23 million over the luxury cap threshold right now, with current salaries equaling over $142 million. Six different players make more than $10 million per year. 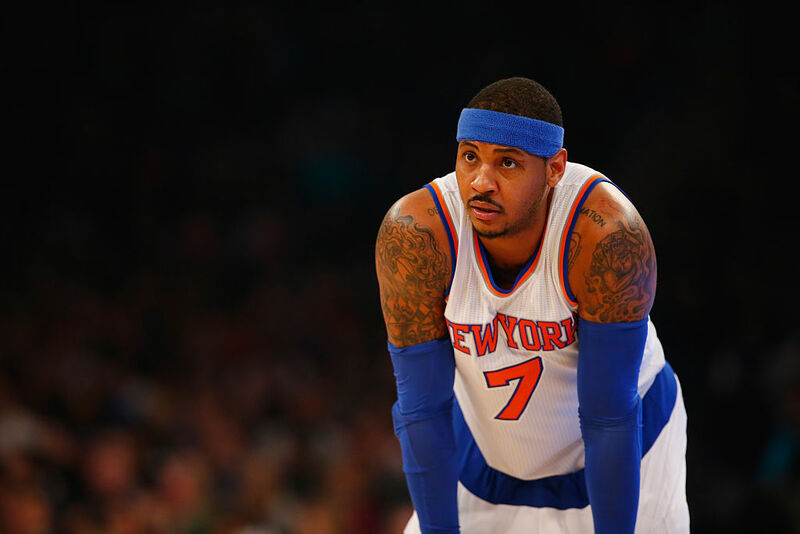 Just one of those (Irving at $18.9 million) would be departing in a deal for Carmelo. That won’t make up the difference in salaries, and that’s before considering what else the Knicks need to give up. Like Houston, you’re pulling in another team or two to make this trade work. The Knicks have more flexibility than both the Cavs and Rockets, currently sitting under the cap and also getting rid of the largest salary in any deal. But there’s still not much New York can deal to truly make a Carmelo deal significantly “better” for the other side. Top trade pieces in any deal would probably include Kyle O’Quinn ($4.1 million), Mindaugas Kuzminskas ($3 million) and/or rookie point guard Frank Ntilinkina ($3.5 million). 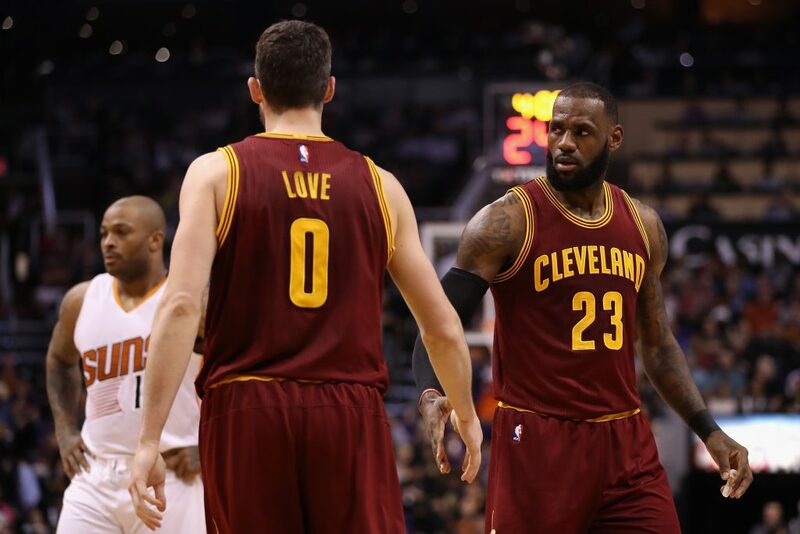 None are earth-shattering additions that make up for the loss of Irving for Cleveland. Carmelo Anthony, the Knicks, Cavaliers and Rockets all want to get something done before the season begins. But as explained above, desire is simply not enough for a ‘Melo trade to work. Other teams must get involved if Anthony is calling a new city home this year. And right now, no one’s necessarily stepping up to the plate to help facilitate Cleveland’s improvement or Houston building a super team.